Fusing stadium-ready guitar riffs, anthemic choruses, and stomping backbeats with passionate lyrics that proclaim a message of hope, Disciple stuffs their self-titled record with muscle, both sonically and emotionally. Huge riffs and even bigger choruses that bounce in your brain. 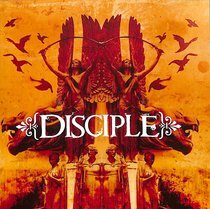 Disciple was formed in 1991 by friends Kevin Young, Brad Noah, and Tim Barrett in an attempt to spread the Gospel while playing the loud, metallic music they loved. Over the years, their style evolved into one similar to many secular alternative metal groups, as they toured churches, high schools, colleges, and similar venues. Their self-released debut, What Was I Thinking came out in 1995, followed by an EP, My Daddy Can Whip Your Daddy, on Warner Resound in 1997. Their sophomore full-length effort, This Might Sting a Little Bit, followed two years later on Rugged Records. By God followed in 2001 on the same label. 2003's Back Again found the band on a new label, the independent Slain Records. The group signed with Sony the following year and released Rise Up in June of 2005. Scars Remain arrived on the Integrity label in 2006.